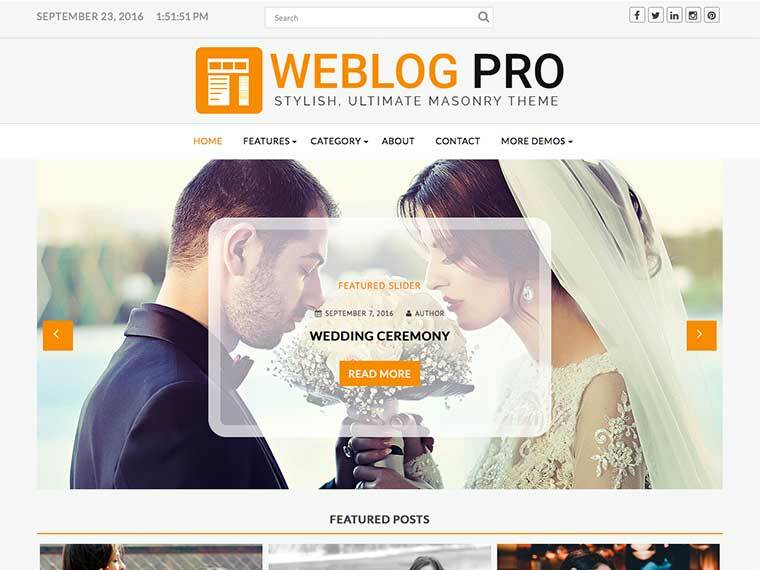 WeblogPro is the most versatile theme for blog, news and magazine sites. Probably the most awesome and featured rich blogging theme in the world. WeblogPro has been designed to be attractive, efficient and speedy user experience. The theme comes with very easy and useful theme options for webmasters without any previous coding experience. Webmaster can easily personalize any pages of their sites presentation with limitless range of available color choices, sidebar options, advanced widgets options, header options, footer options, simple blog layout, column blog layout, masonry blog layout, breadcrumbs, custom CSS, layout options, beautiful feature slider section, feature columns sections, and other limitless options. WeblogPro comes with the best quality coding, elegant design, fast page loading speed and with awesome supports. Webmaster can present site with masonry or without masonry. The theme comes with vast array of paginations options like simple, numeric, ajax loading and auto loading content when scroll. It is WooCommerce compatible and Google AdSense ready. Weblog comes with advanced custom widget for adding author, recent post, post slider etc with different options. You have full control of customizing the front page with featured section with slider and theme options. Multiple layout on front page are available. You have full controls to display-hide and setting up everything in the theme header area. Including logo, search, social, date/time etc. You can enter custom copyright text as well as credit text in the footer area from the theme options. Also, enable social on footer section too. With a single click you can change whole site primary color and also have background color option. You can manage the color of every section with Basic and Advanced color options. In a single post you can easily enable-disable related post through single post options. Manage the every single entity of the related post there. Through the theme options you can enable/disable to show breadcrumb in the site. Use advanced breadcrumb too. You can easily edit placeholder for search widgets and search in the header and other widgets sections. Added very popular social medias on header and footer to link your profile from the site. Add you own logo from the theme option. Instead of logo you can display site title and tagline. And have multiple options to manage logo, site title and tagline. You can enable-disable date/time display in the header easily. Your own language date will appeared there. Some more options are available on this theme. Please go to Appearance => Customize. 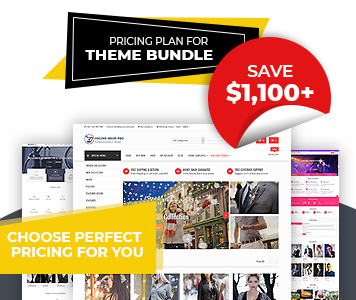 This theme have very awesome featured section with slider and site contents. You can manage them yourself. You can change it according to your need. More than hundred font family used on this theme. Change fonts on site as your need. Lots of options available for managing comment section. Customize this section as your need. You can hide the comment section globally. Advanced navigation options with image and title also. You can hide the navigation as well as change the navigation as your need. Show or Hide author info on single page. You can add the social links, images, descriptions of the author. Post Format is a piece of meta information that can be used by a theme to customize its presentation of a post. It\\\\\\\'s available on the theme.